Cpl. 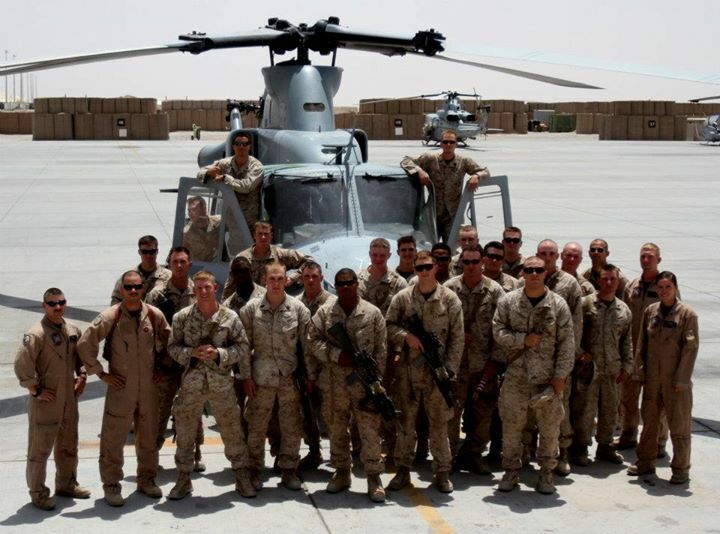 Brandon Moore, an infantryman with 1st Battalion, 8th Marines, (back row right, in front of helicopter door) poses with his squad and the Marine Light Attack Helicopter Squadron 469 “Vengeance” aircrew who provided vital close air support during the ill-fated June 22, 2012, Operation Jaws, on the Camp Bastion, Afghanistan, flightline in July 2012. Moore nodded and responded with a “rock on” sign. His actions over the next six days in Operation JAWS 5 would earn him a Bronze Star with “V” device for valor. Hospitalman Zack Penner, the team’s corpsman, would be awarded a Silver Star. It was late June 2012 and Marines from 1st Battalion, 8th Marines and 1st Battalion, 7th Marines, had been tasked to support the operation, just weeks before they were scheduled to leave the country. After landing at the compound in Helmand province, the Marines dug in. Moving in for a mission like theirs — clearing an area of IEDs and insurgents — involves setting up communications and establishing fighting positions around the walls. As Cervantes, a squad leader with 1st Battalion, 8th Marines, was digging a “murder hole” in one wall. Lance Cpl. Eugene “Gino” Mills stood straight up on the wall, looking out into the distance. “It’ll be a cold day in hell, Taliban,” Mills declared to the Afghan countryside. Mills was ready for a fight. Cervantes yelled at him to get down and they continued their normal preparations. Fifteen minutes later, they began taking fire. “We were getting reports that the main threat was IEDs,” Cervantes said. IEDs were the least of their problems. Enemy fighters continued taking shots at the Marines throughout the day on June 22, 2012. Then Mills was shot. “We just saw him go down, drop to his hands and knees,” Cervantes said. It was Mills who brought the team together to watch episodes of “Jersey Shore” on his portable DVD player every night. Mills, who “could cheer everyone up without even trying,” Cervantes remembered. Hospitalman Zackery Penner, the team’s corpsman, rushed to the wounded Marine’s aid on an exposed rooftop, without his protective gear. Cervantes was outside the compound, coordinating Mills’ evacuation. Moore took control of the roof, leading his Marines to defend against the enemy fire. Once the medical evacuation helicopter left, the fire died down, Cervantes said. The enemy had done enough damage for one day. Cervantes said later that he knew the Marines would be all right because Moore was with them. The next day brought a new challenge: Cervantes was struck with dysentery and could not lead his team on patrol. Moore led the platoon. Moore is soft-spoken, but was quieter than usual during his interview with Stars and Stripes. He didn’t look up as he talked about Operation JAWS 5. He didn’t want to talk about it. They lost contact with their unnamed base about 500 meters into his patrol. “It went downhill from there,” Moore said. About an hour and a half into the patrol, Cervantes said he heard shots. Three snipers had started firing on the patrol. This time, Lance Cpl. Hunter Hogan was hit, along with an Afghan soldier. Moore ran back to the compound to establish communication, then coordinated the evacuation of the wounded. With a working radio in hand, Moore returned to Penner, who was tending the critically injured men. Cervantes said that he had bonded with Hogan — both Texas rodeo cowboys — when he first joined Hogan’s platoon. He had to go through Mills’ and Hogan’s gear at the end of the operation, collecting small personal items to return to their families. Moore’s Bronze Star citation credits him with coordinating Hogan’s emergency evacuation, while directing his squad to maneuver against the enemy. He “exposed himself to heavy enemy gunfire” repeatedly while he worked to get close-air support and an evacuation for Hogan, and to lead his squad. Moore doesn’t see it like that. Though none of them want to take credit, Cervantes said the entire platoon — himself excluded, of course — deserved awards for their actions. “Young men did a job that not many other people could do in their lives,” said Cervantes. Talking about the operation brings out anger in both of them. They should have had more weapons and gear, they said. Cervantes wished he had been there when Hunter got shot. Others should have received medals, they said.